Amos Beach was born on a farm near Grand Rapids, Michigan, the third oldest of a sibship of seven. His parents had homesteaded land newly acquired from the Indians, and growing up Amos would have had the chance to observe Indian families camped along the Thornapple River. He lived through the gradual establishment of the nearest town, Middleville, which started as a stage coach stop and gradually added a general store, a blacksmith, a grist mill, a shoemaker and a carpenter. (Rosentreter, 1979) Amos grew up to fight in the Civil War, and later migrated to Woodburn, a small agricultural community in Oregon. In his old age he was a renowned local citizen, sometimes featured in the local newspaper for his colorful exploits and his memories of the Civil War. Amos Beach‘s life entered the stage of history at age 20 when he and his brother John joined the Union Army to fight in the Civil War (U.S. Civil War). Michigan was strongly pro-Union and about 90,000 Michigan men fought in the war. Amos and John enlisted as privates in the 6th Regiment of the Michigan Cavalry Brigade, on September 20, 1862. (Dunbar & May). The Michigan Cavalry Brigade, also known as the “Wolverines,” was led by the dashing General George Custer. The soldiers were mounted on horseback and fought with sabers as well as pistols and rifles. The Wolverines, as part of the Army of the Potomac, fought in all of the major battles in the Eastern front against Lee’s confederate army. In addition to Gettysburg, the Michigan Cavalry Brigade fought mainly in Maryland and Virginia. (Urwin.) Today a large monument at the Gettysburg battlefield commemorates the Brigade’s contribution to the war effort. The obituary reprinted below lists all the battles in which the Brigade participated. In his later year years, Amos Beach became a town character and told colorful stories about his war experiences. It is not always possible to reconcile these stories with the facts of the Civil War; however they do illustrate that Amos Beach continued to identify himself strongly as a Civil War veteran for the rest of his life. It is very possible that Beach was taken prisoner during the skirmishes around the Rapidan; we know that a number of Union cavalry were captured in these encounters. Beach also recounted that he escaped from prison and was hidden from the Confederate Army by “friendly negroes.” The rest of the story cannot be reconciled with the facts of J.E.B. Stewart’s life, but does show Beach’s vivid and personal style of recounting his war experiences. “[T]hey were taken down the Ohio river, across plains and mountains to Fort Leavenworth, Fort Laramie and further on, to stop the depredations of the Indians. They were greatly disappointed, not knowing that they were to be used to fight “Injuns”, not finding out the purpose of the movement until they reached St. Louis. It took 38 days to go from Leavenworth to Laramie and they had several fights with the Indian tribes, Sergt. Beach seeing many men, women, and children scalped and killed.” (Death Calls Amos Beach). In tracking down the graves of Amos’s parents, I learned that his father died in 1863 and his mother a year later while he was away fighting. It seems safe to say that these losses would have added to whatever trauma and dislocation Beach might have been feeling as a result of his war experiences. Four months after he returned to Michigan, in March, 1866, Amos married a local young woman, Clara Hatton. Amos and Clara had two children who died in infancy, and six more whom they raised on their farm in Thornapple Township, Michigan, near Grand Rapids. In 1883 Clara died from an accident with a horse and buggy, leaving Amos a widower at age 41 with a large, young family (Whitelaw, Alvis). According to his great-grand daughter, Alvis Whitelaw, Amos had discussed moving to Oregon for many years, but his wife, Clara, was opposed. Her death, though sincerely mourned, removed a barrier to the plan. Amos and his brothers, John and Lauriatt, all moved to Oregon with their families in the 1880s by transcontinental train. Amos and his six children arrived in Woodburn in 1886. At that time, Woodburn was a newly founded small town on the Willamette River, near the state capitol, Salem. It was the center of an agricultural community. When Amos arrived in Woodburn, his six children, five girls and a boy, ranged in age from 16 to about 2 years old. Amos Beach in later years. Beach became the first Marshall of Woodburn. Located at a railroad junction, the town had a problem with tramps, men who traveled by hiding in box cars, and it was Beach‘s job to move the vagrants out of town. For this he received about $50 a year in salary. He had a reputation for eccentricity, feistiness, and personal courage; his career as Marshall was legendary. Gene Stoller compiled these stories for an article in the Woodburn Independent in 1987, about 60 years after Beach’s death, quoting articles that had appeared much earlier. According to Stoller, the townspeople remembered Beach’s vigorous way of celebrating the Fourth of July. “Beach’s grandson, Glenn Goulet, prevailed upon his grandfather to go to the showing of the motion picture, “Birth of a Nation,” in 1916. The old marshal, then in his 70s, at first didn’t want to go as he felt that movie actors couldn’t do justice to the portrayal of the great civil war in which he had fought. Goulet finally convinced the elderly man and they attended the show together. Amos Beach and his great granddaughter Alvis Love, my mother, in 1912, Woodburn, Oregon. For this he was awarded a pension of $6 a month, starting in 1890, when he was 48 years old. By the time of his death in 1926 his pension had increased to $65.00 a month. He died at home in 1926, at age 84, of a cerebral hemorrhage, and was buried at Belle Passi Cemetery in Woodburn. The bronze star of the Grand Army of The Republic decorated his tombstone, and commemorates the defining event in his life, the War between the States. Amos Beach is on your personal Ancestor Fan. He is the grandfather of Alvis Love Whitelaw, and the great grandfather of John, Susan and Nancy Whitelaw. Civil War Veteran Who Climbed Wauna Point at Age of 78. The Oregonian, 1 Aug. 1920, Sec. 2, p. 20. Dunbar, Willis F. 7 May, George S. (1995) Michigan: A History of the Wolverine State. 3rd revised ed. William B. Eerdmans Publishing Co., Grand Rapids, MI, pp. 316-327. Harvey, Don & Lois, eds. The Michigan Cavalry Brigade. Available on-line at www.michiganinthewar.org/cavalry/michbrig.htm Retrieved: 9/2011. Invalid Pension Application of Amos Beach, June, 1891. U.S. National Archives and Records Administration. Rosentreter, Roger. (1979). Barry County. Michigan History, Vol. 63, No. 4, pp. 3-7. Stoller, Gene. (Oct., 1987) Indian fighter really meant business. Woodburn Independent, Woodburn, OR. Urwin, Gregory J.W. (1990) Custer Victorious. University of Nebraska Press, Lincoln, NB. U.S. Civil War Soldier Records and Profiles [database on line] Provo, UT. The Generations Network, Inc. 2009. Whitelaw, Alvis. Interview with Susan Whitelaw, 1985-1993. Portland, Oregon. 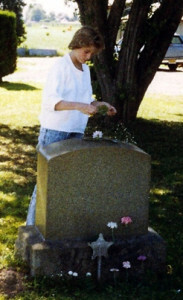 Shelley Downs, Beach’s great great great granddaughter at his grave, 1986. Civil War Veteran Succumbs to Attack of Cerebral Hemorrhage. Masonic Funeral Friday. One of the two remaining Civil War veterans in Woodburn passed away at his home on Settlemeier Avenue at 11:30 a.m. Wednesday, December 22 of cerebral hemorrhage, aged 84 years, 5 months and 24 days. The funeral will be Friday, December 24, at 1:30 p.m. Services will be under the auspices of Woodburn Lodge No. 106, A.F.&A.M., of which he was a charter member. Services will be at Masonic Temple and interment at Belle Passi. During the service of the brigade it had been engaged with the enemy at Hanover, Va., June 30, 1863; Hunterstown, Penn., July 2, 1863; Gettysburg, Penn., July 3, 1863; Monterey, Md., July 4, 1863; Cavetown, Md., July 5, 1863; Smithtown, Md., July 6, 1863; Boonsborough, Md., July 6, 1863; Hagerstown, Md., July 6, 1863; Williamsport, Md., July 6, 1863; Boonsborough, Md., July 8, 1863; Hagerstown, Md., July 10, 1863; Williamsport, Md., July 10, 1863; Falling Waters, Md., July 14, 1863; Snicker’s Gap, Va., July 19, 1863; Kelley’s Ford, Va., Sept. 13, 1863; Culpepper Court House, Va., Sept. 14, 1863; Raccoon Ford, Va., Sept. 16, 1863; White’s Ford, Va., Sept. 21, 1863; Jack’s Shop, Va., Sept. 26, 1863; James City, Va., Oct. 9, 10, 1863; Brandy Station, Va., Oct. 11, 1863; Buckland’s Mills, Va., Oct. 19, 1863; Stevensburg, Va., Nov. 19, 1863; Morton’s Ford, Va., Nov. 26, 1863; Richmond, Va., March 1, 1864; Wilderness, Va., May 6, 7, 1864; Beaver Dam Station, Va., May 9, 1864; Yellow Tavern, Va., May 10, 11, 1864; Meadow Bridge, Va., May 12, 1864; Milford, Va., May 27, 1864; Hawe’s Shop, Va., May 28, 1864; Baltimore X Roads, Va., May 29, 1864; Cold Harbor, Va., May 30 and June 1, 1864; Travillian Station, Va., June 11 and 12, 1864; Cold Harbor, Via., July 21, 1864; Winchester, Va., Aug. 11, 1864; Front Royal, Va., August 16, 1864; Leetown, Va., Aug. 25, 1864; Shepardstown, Va., August 25, 1864; Smithfield, Va., Aug. 29, 1864; Berryville, Va., Sept. 3, 1864; Summit, Va., Sept. 4, 1864; Opequan, Va., Sept. 19, 1864; Winchester, Va., Sept. 19, 1864; Luray, Va., Sept. 24, 1864; Port Republic, Va., July 26, 27, 28, 1864; Mount Crawford, VA., Oct. 2, 1864; Woodstock, Va., Oct. 9, 1864; Cedar Creek, Va., Oct. 19, 1864; Madison Court House, Va., Dec. 24, 1864; Louisa Court House, Va., Mar. 8, 1865; Five Forks, Va., Mar. 30, 31, and April 1, 1865; South Side R.R., Va., April 2, 1865; Duck Pond Mills, Va., April 4, 1865; Ridge’s or Sailor’s Creek, Va., April 6, 1865; Appomattox Court House, Va., April 8 and 9, 1865; Willow Springs, Dakota Territory, Aug. 12, 1865. In addition to the foregoing war record, many incidents in Sergt. Beach’s active career during the conflict between North and South could be given, one being the time when he shot at General Stuart, hitting the hat and cutting the cord and tassel from it, after which he was taken prisoner and held in a bullpen with scarcely anything to eat for 2 weeks and a day, when he made his escape and with the assistance of friendly negroes got through the rebel lines to his own regiment. After the grand review in Washington following the conclusion of the war he started with comrades for, as he supposed, home, but they were taken down the Ohio river, across plains and mountains to Fort Leavenworth, Fort Laramie and further on, to stop the depredations of the Indians. They were greatly disappointed, not knowing that they were to be used to fight “Injuns”, not finding out the purpose of the movement until they reached St. Louis. It took 38 days to go from Leavenworth to Laramie and they had several fights with the Indian tribes, Sergt. Beach seeing many men, women, and children scalped and killed. He was in this service for six months before being allowed to return home. This extra service was performed after he had been mustered out at Fort Leavenworth, in the fall of 1865. In 1866 Sergt. Beach married Clara Hatton, an English girl, at Middleville. To this union were born eight children, two of whom, a boy and girl, passed on. The six surviving children are Mrs. Florence Goulet, Mrs. Nettie Zimmerley, Mrs. Mary Whitman, Mrs. Laura Livesay and George Beach, all of Woodburn, and Mrs. Sarah Hardcastle of Salem. This entry was posted in 19th Century, Beach, Civil War on October 21, 2012 by Susan Whitelaw.